The best located hotel in Twente! Welcome to the most beautifully situated hotel in the Twente region! When you come and stay with us, you can be assured of a wonderfully relaxed stay, entirely tailored to your requirements! It is our pleasure to take you on a welcoming, relaxing, tasty and educational trip through Twente. Our guests frequently use the word ‘friendly’ when they describe ‘t Kruisselt Hotel and that is precisely what we are! Book a hotel package with us and come and optimally enjoy yourself! – Its location; in the midst of the stunning Twente countryside. Hotel bicycles are included in our package! – An oasis of calm; we offer you the opportunity to optimally unwind. – Carefree enjoyment; of the delicious artisanal dishes prepared by our chefs. – Excellent care; from the freshly made beds to a tasty breakfast buffet made of the freshest ingredients. – The finest and always up-to-date walking, cycling and driving routes through the Twente and border region! – A challenging 9-hole par-3 golf course; straight onto the course from your hotel room. – Knowledge about the Twente region and its population; our front office staff are true Twente experts! – Complete packages; comprehensive and with an excellent price-quality ratio. All 42 rooms are situated on the ground floor or are accessible by lift, with the exception of our authentic monastery rooms (maximum of 2 floors). If you book directly with the hotel by telephone or online you do not get charged any booking fees. 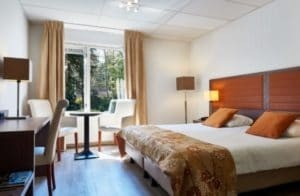 ‘t Kruisselt Hotel – This renowned hotel is situated in the midst of the beautiful Twente countryside. Enjoy a wonderful, fully catered stay and discover the region by bike, on foot or by car and totally unwind!